iTech has launched what they claim as the worlds first wireless virtual keyboard. 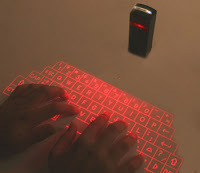 It uses laser projection technology to project a full size keyboard into a flat surface. It does support HID and so should work with Nokia E series phones as well and people have indeed paired it up with their phones.